When giving someone directions to my house, I’d specify by saying, “It’s the house with the big blue tarp.” Strapped on by hefty ropes and a variety of bungee cords, the 50 by 30 foot tarp enabled us to use our mixing bowls for cooking rather than collecting rain water indoors. On stormy nights, it sounded like we were raging choppy seas on a medieval sailing ship, and on windy days we raced from the car to the front door, maneuvering an obstacle course of flying tiles and cement. After getting multiple quotes from roofers, it was apparent that the tarp was here to stay. At the bare minimum, a new roof was going to cost ten grand. They might as well have told us ten million. We just didn’t have the money. Then tragedy struck. Specifically, that tragedy struck my left breast. On a clear, calm day, a large Mexican tile hurled itself from the roof, took aim and collided with my not-so-endowed chest. Fortunately (or unfortunately, depending on how you look at it) I don’t have implants, or I may have needed a quick silicone patch. The debris could have hit one of my three kids in the head – or the head of one of their 30 regular playdates. Our 81-year old roof was no longer the brunt of my poor white trash jokes. It was now a life or death issue. At the very least, it was a costly lawsuit waiting to happen. My husband and I bought our home in 2005, just as the height of the market was starting to peak. We’re not necessarily underwater, but we’re like a young toddler wildly treading that water, barely staying afloat. 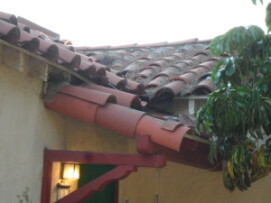 We’ve been trying to refinance, and I had hoped we could get some equity out of the house to pay for a new roof, but it turns out my hopes were higher than our collapsing roof. We cleaned out our two $1000 Rainy Day Funds. After all, there’s nothing like a leaky roof to realize that Rainy Day Funds should literally be spent before that Rainy Day wrecks havoc on your indoor furniture. We tapped out the last of our home equity line of credit (AKA the Monsoon Day Fund) that enables us to pay our bills while I’m on hiatus. We juggled bills, cancelled services, and postponed debts that wouldn’t hurt our credit score. I awkwardly mentioned to friends I’ve loaned money to that now would be a really good time to consider paying me back. Unfortunately, they were all in the same financial dire straits they were in when they hit me up in the first place, and as they say, you can’t get blood from a turnip. A relative of mine has a few bucks, so stuttered through a humiliating plea, only to get immediately turned down. I crawled with my tail between my legs and asked my ex-husband for an advance in child support for our two daughters, and he actually came through for me – even graciously. Now I have to be really really nice to him for a very very long time. On the other hand, it’s a pretty small price to pay for the safety of his little princesses’ noggins. We were now completely tapped out, and still had $5000 to go. I was losing sleep, wondering how much money I could make if I sold oranges and lemons from my backyard trees. Could I take in laundry or clean houses? Sell blood? Plasma? Did we have anything of value we could sell on ebay? The only jewelry worth more than 50 bucks is my wedding ring, and that would just be sad – pawning off the symbol of my (current) husband’s love to literally pay for the roof over my head. Even if I was desperate enough to search for a little Mafia money, how in the world would you find a loan shark in Valley Village? On August 2, the federal government will reach its debt ceiling limit of $14.3 trillion. I had reached my own debt ceiling, and mine was nowhere near $14.3 trillion. And like the US government’s AAA rating, my credit score is good, and I’d like to keep it that way. So I just did what any other worthy Democrat would do. I raised my debt ceiling and got a cash advance. It’s actually a great deal. Just a 3% fee and no interest until July 2012. Now my ceiling is in debt, but at least it no longer leaks. prior to writing. I’ve had trouble clearing my mind in getting my ideas out there. you might be interested feel free to send me an email.